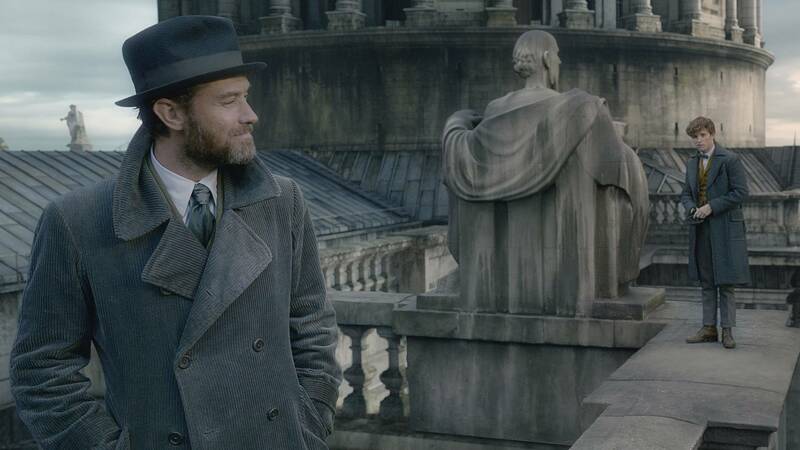 Jude Law and Eddie Redmayne star in "The Crimes of Grindelwald"
Gone is the frivolous tone of the first Fantastic Beasts film, as if whisked away by a portkey. Here instead in The Crimes of Grindelwald: Melodrama, and lots of it. And it's not necessarily a bad thing. Though a light adventure can still be rewarding, there's a pleasant heft and somewhat absorbing drama to Grindelwald, which previews Thursday and opens Friday in all of Amarillo's multiplexes. Soon, wizards everywhere are looking for the evil one, though not, at first, our hero, Newt Scamander (Eddie Redmayne). He'd much rather tend after his own menagerie, even as Albus Dumbledore (Jude Law) and his brother Theseus (new addition Callum Tuner) plead with him to choose a side. Meanwhile, Dumbledore wants Newt to travel to Paris to search for the missing Credence Barebone (Ezra Miller), who's not as dead as he appeared at the end of the first Fantastic Beasts film. Then, Newt's American friends Jacob (Dan Fogler), whose Muggle brain wasn't quite wiped clear last time, and his new fiancé Queenie (Alison Sudol, who's delightful), show up. Eventually, Newt agrees to travel to Paris with Jacob to find Queenie's sister Tina (Katherine Waterston), whom he's still carrying a torch for and who is now in Paris herself chasing Credence. Got that? Wait, there's more. Grindelwald is also seeking out Credence, thinking he can use the young man as a weapon to defeat Dumbledore who, meanwhile, refuses to help the good guys seek out Grindelwald because of the potent bond they formed as younger men. (More on that in a second.) And Credence, on the hunt for his biological family, has bonded with a young woman named Nagini (Claudia Kim) who, yes, will eventually transform permanently into a snake and work for the evil Voldemort in the Harry Potter era. You could never accuse Rowling of having too few ideas — witness the ever-expanding page counts of her books — and in this spin-off series, she has found the perfect collaborator to indulge her maximalist tendencies: Herself. With Rowling as screenwriter, there's no one around — like Steve Kloves, who adapted most of her Potter series into films — to try much in the way of reining back. Largely, it still works out — at least in terms of a rollicking story, despite the density of the plot. There are bits and bobs of levity (not enough), and most of the characters get a nice spotlight moment or two. And Rowling isn't shy about adding some soap-opera style twists like long-lost siblings, romantic triangles, heartbreaking flashbacks — even a tragic gay love story. Ah yes, that. Rowling offhandedly outed Dumbledore in 2007 and said that the wizard's "great tragedy" was his love for Grindelwald, who went on to nearly destroy the world (still to come in this apparently five-part franchise). Knowing that, it's easy to read between the lines when Dumbledore thinks back on his bond with Grindelwald. But saying "We were closer than brothers" is a poor substitution to admitting the obvious. Love stories of all kinds, though, aren't necessarily Rowling's strong suit. We're supposed to believe, simultaneously, that Newt has a great passion for Tina and that he still has feelings for Leta, as well, but there's nothing really to support either idea. It doesn't help that Redmayne is even twitchier this time around as Newt. I get that he's an introvert and more comfortable with his beasts than with humans, but he's just not that interesting. You can tell that Rowling is twinning Newt with Credence — both of them are outsiders, both of them sought out as valuable soldiers in the coming war. But there's not enough depth in either character to make the connection really work. In the end, The Crimes of Grindelwald is more successful than the first installment, and it generally bodes well for for the remaining chapters. Hopefully, there aren't too many more world-shattering reveals to come (there's a biggie here), so that Rowling has more time to go deeper with her characters. Chip Chandler is a producer for Panhandle PBS and a member of GALECA. He can be contacted at Chip.Chandler@actx.edu, at @chipchandler1 on Twitter and on Facebook.